NB: LifeBook 2017 students, see below before you buy! 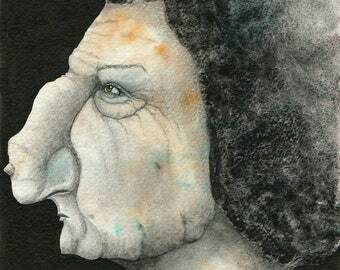 Have you always wanted to learn to paint more intuitively with watercolor and make faces and stories come to life on paintings and in art journals? 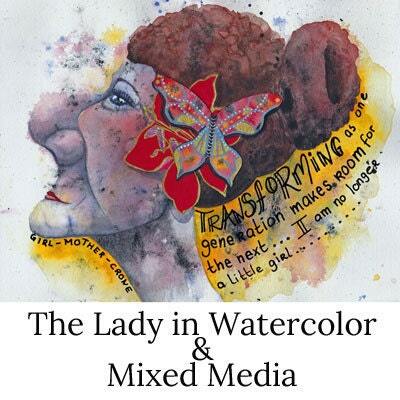 Learn to paint more intuitively with watercolor and mixed media in The Lady in Watercolor and Mixed Media online workshop! “The online course Mixed Media Character Faces, was great fun to do. Mandy gave me some advice how to continue my painting when needed and that made it even more worthwhile. Go with the flow! And this time, do so very literally! This workshop is perfectly suitable both for beginners and more advanced artists. Beginners will be able to achieve great results by allowing to let the flow guide them and more advanced artists will find a challenge in painting beyond the rules they knew thus far. The painting starts with a cloud of color that will empty your mind and set the tone for the rest of the painting. Then, by balancing and adding layer by layer you will see your character and your story come to life under your fingertips! Whatever you’ve learned about painting portraits, throw it overboard for this workshop! Things like proportions, symmetry and composition are not what we work with for this project. This workshop uses a rather different approach to painting, namely, a natural and intuitive one. That makes this course extremely fit for those who are new to painting and for those who want to loosen up in their work. Are you ready for a fun and exciting journey? Then sign up for this course! You will have immediate access to all course content so you can start within minutes!!! This workshop contains 12 real-time downloadable instruction videos (almost 3 hours of footage in total) and a step-by-step PDF to work offline. There is a closed facebook group for sharing and feedback. This workshop is self-paced. Immediately after purchase you can download the access document on Etsy which includes the passwords you need to access the course site and the course videos. If you really want life-long access, be sure to download the videos and store them on your hard drive! The art-supply list and Step-by-step PDF are downloadable as well. The course contains a video explaining how to download these files and videos. o	Round brushes (I use selected filament sizes 5 & 14). Make sure they have a really sharp tip for easy detailing. A basic travel set of 12 colors will contain all the colors you need. Before you buy, you need to know that there can be NO refunds for this purchase. The nature of a digital, downloadable product is such that refunds do not apply. Important: when buying this workshop, you purchase the right to download and use the course material for your own personal use. You do NOT buy copyright and therefore the course material cannot be copied, shared and broadcast or otherwise distributed without written permission by the owner, yours truly. By purchase of this course, you automatically agree with these terms. IMPORTANT FOR LIFEBOOK 2017 STUDENTS! The techniques in this online workshop have been covered in my Life Book 2017 main lesson for the greater part. However, it is NOT the same online workshop, so for those who enjoy this technique and who want to do another project in this technique, you'll be happy to take this one that is quite different from the Life Book lesson. Life Book 2017 students can find a discount code in the online course that they can use at checkout for this online workshop. Online Watercolor & Mixed Media Workshop "I wish, I wish..." + BONUS: "From wishes to needs"
Online Workshop Cool Watercolor Faces by Mandy van Goeije - 1 technique, 3 art journal pages!!! Good explanations and very clear instructions, pdf as well as video. I love this class. I have taken other classes with Mandy. She puts all of herself and talent into every one of them. I learn so much in her courses. Online Gouache and Mixed Media Painting & Story building Class "Mirror, mirror..."
Mandy's creations will not only add beauty into your life, but will open your imagination.